WHEN Hibernian start their SPL match against St Johnstone on Monday evening, they will be able to claim an unusual distinction: that of having played at least one game on each day of the week this season. After their first few league games were on Saturday or Sunday, Hibs played at Queen of the South in the League Cup on a Tuesday in late August. They have since played at Fir Park on a Friday night, McDiarmid Park among other venues on a Wednesday, and Tynecastle on a Thursday. Pat Fenlon’s players must be used by now to the demands of TV scheduling, and what day of the week they play on appears to have little influence on results. Yesterday, the Easter Road manager said that, in principle, he would prefer to have games played at the weekend, but in this particular instance would be happy with the delay, as it gave some of his players longer to recover. “I would prefer to play at the weekend, but we know TV dictates when football matches are played,” Fenlon said. “It’s not ideal, but we’ll just get on with it. There are pluses – it gives Jorge Claros, Ryan McGivern and Tim Clancy more time to recover, so that’s a positive. But I’d prefer to be playing on a Saturday. “Since I’ve been at this club, we’ve played every day of the week. You would need to ask other people why that’s the case – I’m not too sure myself. While it might be advantageous to broadcasters to have matches screened live every night of the week, Fenlon is convinced that such variety makes it harder for clubs such as his own to attract bigger crowds to their games. “The aim is to encourage people to resume or start a regular football-watching habit, but when games are on so many different days, attendance, by definition, cannot be habitual. The advantage of playing at night time here is that the atmosphere is definitely better,” Fenlon continued. “But it is difficult for the supporters – that’s the one thing you have to look at. One of Hibs’ happiest occasions last season was in fact on a Monday at Easter Road – the game against Dunfermline, which they won 4-0 to ensure their survival in the SPL and send the Fife club down to the First Division. But if previous games this season are anything to go by, the St Johnstone match will be considerably closer. Hibs won 2-0 at home in August, then scraped a 1-0 win in Perth in November, when Paul Cairney scored a late winner after Ben Williams had saved a penalty. Midfielder Claros and defenders McGivern and Clancy are all at different states of readiness at present. If the match were being played tomorrow, perhaps only the Honduran would be passed fit to play, although even then he would be fatigued after playing in his country’s World Cup qualifying home win over the USA. McGivern has a hamstring strain but is odds-on to be selected, and Clancy, who has a similar problem, is rated 50-50. “The commitment of Jorge was to wait until after the Aberdeen game before travelling – he could have went beforehand,” Fenlon explained. 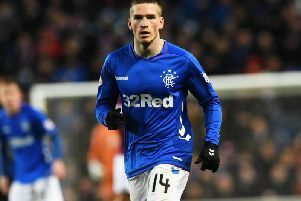 Liam Craig, who has signed a pre-contract with Hibs, is expected to turn out for St Johnstone. Fenlon tried to sign the midfielder during this transfer window, but said he did not press the issue after his initial interest was rebuffed.